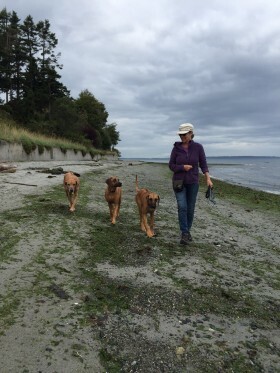 Jane is a certified professional dog trainer, living in Victoria, BC. She started The Noble Hound in 2002 and teaches small-size group classes for puppies and family dogs at two local recreation centres. In addition, she provides private consultations for dogs that need individual attention or to help people get started on the right track with a brand new puppy. Jane’s own dogs are Rhodesian ridgebacks which are known as a versatile breed. She has participated in many different activities including: Obedience, RallyO, Agility, Straight-racing, Tracking, Herding and Conformation. Her dogs have their Canine Good Neighbour certification, amongst other titles, and have been registered pet therapy dogs, visiting schools, hospitals and senior residencies. However her favourite activity remains going for long walks with her dogs. She believes that it is essential that dogs get sufficient exercise and mental stimulation to prevent many of the behaviour problems that arise out of an excess of energy and or boredom. In 2005, Jane was certified by the Certification Council for Professional Dog Trainers www.ccpdt.org which is recognized internationally for testing and certification of animal trainers and behaviour professionals. Continuing education is required to maintain certification and Jane attends seminars and lectures on a regular basis. She has been particularly influenced by Dr Ian Dunbar, Suzanne Clothier, Terry Ryan, Ken Ramirez, Michele Pouliot, Kay Laurence and Nicole Wilde. Jane believes that the bond between dog and human is paramount and does NOT believe in using physical force or any method that will intimidate or make a dog fearful. Her method of training is reward-based, using positive reinforcement which is scientifically proven to achieve results by marking and rewarding desired behaviour. Patience, consistency and a good dose of fun round out her training technique. Jane believes in two-way communication with our dogs; that we are our dogs’ guide and should train with understanding and respect and that by so doing so we will strengthen the relationship. She believes in promoting responsible dog ownership through education and training.